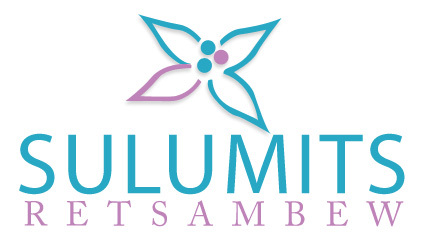 What is sulumits retsambew i hear you ask? 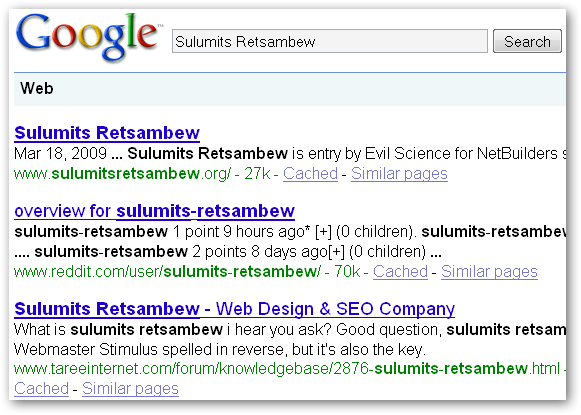 Good question, sulumits retsambew is obviously Webmaster Stimulus spelled in reverse, but it's also the key phrase for a Search Engine Optimization competition currently being run. It started just over a month ago on the 15th March and ends 15th August 2009 at noon GMT. It's being run by the folk over at NetBuilders.org if you want to take a look. Anyhow this isn't an official entry, i just thought i'd throw up a page and see how it fares with no external backlinks at all. There's a few solid Web 2.0 properties such as Mixx, Twitter etc in the top 50 with similiar optimization to this page (Term in the Title, URL and a few mentions on the page and no targetted backlinks to the actual page) so it's unlikely i'll jump ahead of these domains with +200 Million URL's and huge domain authority. If the galaxies collide and i do rank numero uno for sulumits retsambew and you really want to give me the money, pick out a good charity (preferably to do with kids) and give it to them. Just an update, i totally forgot about this after posting it but i just noticed some hits in my logs for the Sulumits Retsambew search term. So.. I checked the rankings from the USA and this page is #3 which is a surprise considering i estimated i would land on Page 3 and not Number 3. There's a few solid Web 2.0 properties such as Mixx, Twitter etc in the top 50 with similiar optimization to this page (Term in the Title, URL and a few mentions on the page and no targetted backlinks to the actual page) so it's unlikely i'll jump ahead of these domains with +200 Million URL's and huge domain authority. Looks like i'm eating my words a little, i jumped ahead of the domains mentioned but there's Reddit above me in #2 and the exact match Sulumits Retsambew domain in the .org extension at #1. Also checking image search my little picture above isn't listed, however back on Page 11 my avatar is showing up which is interesting considering it doesn't have the keywords in the file name. A lot of the result i achieved is due to fresh content boost, and will no doubt will drop a little as the content becomes a little more "stale". So what i just done to combat that is added a link to this page at the bottom of the forum. However up until now when i noticed this at #3 i have done nothing, just made the post and added no external links or links from within the site. you get our Google vote here. Thanks mate, the sulumits retsambew results are jumping a "lot" compared to other competitions i have watched. I have my suspicions why, and what bits of the algo are driving the results on the front page but for now i will keep watching. I don't really expect this rank to stick too long because i'm not working to build links, or promote the page in any way just having a bit of fun. Although i'm surprised the domain authority of this site jumped it above the likes of Mixx, Ezine, Reddit, Digg etc. I know this site is strong, just not "that" strong. sulumits retsambew image search is also interesting to me, i've got my avatar, forum read/unread images all showing up well back in the results but the images above with the keyword in the file name aren't indexed yet. Anyhow thanks for the post and link mate, your blog must get a nice stream of traffic to it because i've had about 80 referrals from it all up. Google SERP is serving real shocking results for sulumits retsambew SEO contest. Few of the very stable sites lost their positions & new entries like for this Forum and many other Web 2.0 entries are making Sulumits Retsambew competition more interesting everyday. Google results are changing every now and than which normally doesn't happen but with sulumits retsambew contest, I feel Big Dadyy aka Google is also playing . Everyone is now in dilemma, who will ultimately rank on Google first 3 positions on 15th August. My wishes are with everyone! I thought to share my views at this Forum, that's why joined Tareeinternet SEO forum finally...hope to stick with this for long period. Afzal Khan - Sometimes I GoOgle myself, when I am all alone! Here's my another sulumits retsambew entry which was on 7th position few days before but now dropped to 2nd page. Thanks for dropping by afzee lol, you know you don't need to create 6 hyperlinks to the same URL with the same anchor text only the first one counts. In fact, it looks fairly unnatural to Google and if anything they are likely to flag the link as spammy. Also having 100% of your anchors to that page with "Sulumits Retsambew" as anchor isn't natural at all, you really should throw others in the mix like "Cool Site" or "Click Here" or even the root domain name. The big G uses a bunch of historical data, link acquisition rates, link nodes and so on when weighing SERP factors. I didn't build any links to get this page to #2 but if i did these are things i'd take in to account. Anyhow, good luck in the competition i hope Google is favorable to you. Thanks for dropping by afzee lol, you know you don't need to create 6 hyperlinks to the same URL with the same anchor text only the first one counts. we're much stronger in the UK than the US now, that top 20 for SEO is gone from the US and back in the UK now, can't knock the ol' WMT geo targeting, only set it to UK on the 18th Dec.
Hey Amigo, it was very interesting when the page dropped. This page was sitting at #4 and within an hour of Google detecting afzee's "link bomb" post above it fell about 10 spots. I could tell Google picked up on it due to the SERP changing to "6 Posts - 3 Authors" above the description just before it went. However it's slowly clawed back to the front page. I've noticed the .org sitting in #1 is rock solid, almost like Google has blessed it as the authoritative domain for the sulumits retsambew keyphrase. Also not much movement for TareeInternet on the image SERP's. So you changed your geo to the UK? How come you done that? One thing i've noticed with .co.uk domains is they rank well when searching Google.com from Australia. Have you noticed more Aussie traffic since switching?